In “Heat Wave,” the Porters and all the denizens of the Land of the Lost endure a terrible and long-lasting drought. 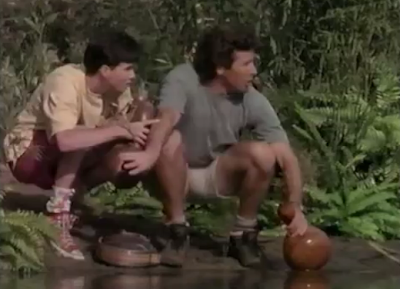 In desperate need of water, Kevin and Mr. Porter hike to a local watering hole only to discover that the Sleestak are already intent on using it. 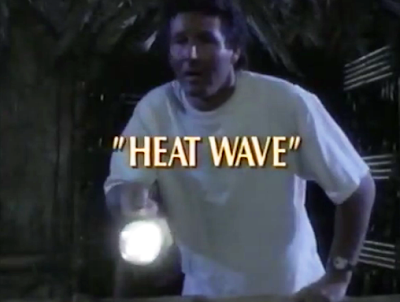 “Heat Wave” is a relatively undistinguished, though harmless, episode of the 1991-1992 Land of the Lost remake. It’s more of a “runaround” than anything else, and the episode eats up its running time with the Porters being chased by Sleestaks, or simply hiding from them. The main idea of “Heat Wave” is that it would be “game over” for the Porters if the Sleestak learn the location of their treehouse and compound. This is so presumably because the Sleestak are so powerful and threatening. They would take the house by force for themselves, and kill or enslave the Porters and their entourage. 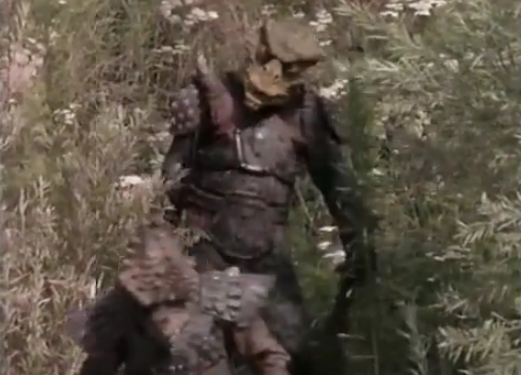 Unfortunately, the new series has routinely treated the Sleestak as comic buffoons, and demonstrated again and again how the Porters out-smart and out-fight them. In other words, the episode’s central threat doesn’t really work as meaningfully as it should. By contrast, on the original series the Sleestak were indeed menacing, and I remember some terrifying episodes in which they swarmed the Marshalls’ home (a temple, at that point) by night, and could barely be repelled. The three Sleestak outcasts of the new series – seen in broad daylight -- just don’t rise to that level of terror. Accordingly, “Heat Wave” is never particularly thrilling or interesting. The only interesting aspect of it is the pairing of Porter and his son, Kevin. 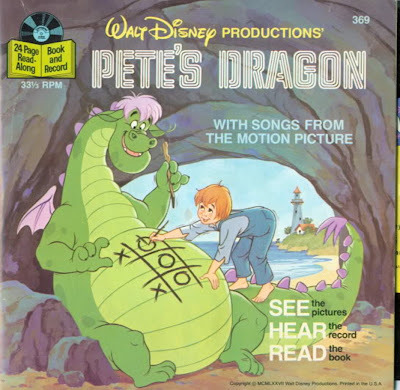 The episode becomes about their “father/son” bonding, but even this aspect of the tale would have felt more meaningful if the conflict with these re-done Sleestak were stronger villains. John you are correct '91 Sleestak are comic relief while the '74 Sleestak were a threat. The '74 Marshall family first lived in a defendable high bluff cave and then an abandoned stone temple. However, the '91 Porter family live in a treehouse that could easily be conquered by any threat including the Sleestak or Trex. Too Swiss Family Robinson. The Sleestak could follow the SUV tire tracks back to the treehouse. Marshall's had fortresses, while the Porter's had a whimsical treehouse.